The best dreams happen when you are awake. Priya is pursuing B.Com Hons. and shares her wonderful experience of internship days. 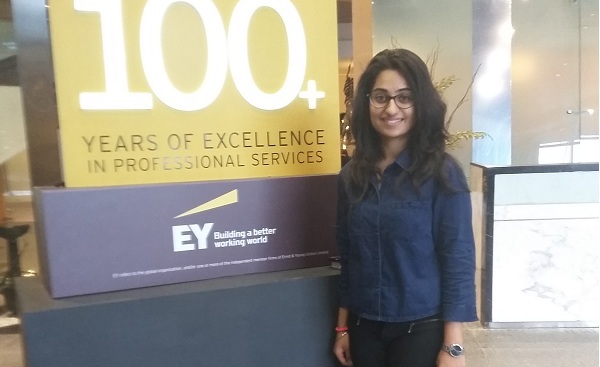 My internship at Ernst and Young was a superb learning experience! I got it after 5 months of email writing and interviews but it was surely worth the effort. I have just completed my first year of B.Com Hons. from Kamala Nehru College, Delhi University. I yearn to tirelessly work in the field of finance and management and I did exactly the same thing at EY. My mentor Mr. Pankaaj Chadha, Senior Partner, EY, placed me in the Financial Accounting and Advisory Team which is administered by Assurance. To tell you from the beginning, my first day at EY involved a lot of waiting, talking, HR formalities and being told ‘you are so young to be here’. I took that as a compliment and went ahead with confidence, after having understood my role and responsibilities, I discussed my project to be undertaken with my mentor. The first week involved a lot of reading and studying, making notes and being thorough with accounting concepts. Oh! they have a wonderful collection of books and you can access them anytime and read on your desk with a hot cup of coffee! By the end of the first week my internship project topic as decided, was ‘Proposal for Media Industry to Implement Ind AS115’. I was overwhelmed when I was given this work, soon after which I realized how much effort it demanded. I was staying in Noida, and had to gather the courage everyday to travel 2.5 hours to reach my office in Gurgaon at sharp 9:15 am, they weren’t strict about timings at all, but I chose to be disciplined otherwise I tend to lose commitment. It got difficult, as I wasn’t keeping too well but the work interested me a lot and I went everyday with the same motivation and passion. I just took one leave in the whole tenure of my internship. To talk about the progress in the second week, I started with making pitch presentations for clients, understanding and modifying existing solutions, getting P/Os ready and I even got to attend the ‘Company’s Act Master Class’ by senior advisors and partners, it was a great workshop. I diversified my work, into understanding CSR and studying the Companies Act 2013 thoroughly. My mentor was very friendly and always full of encouragement, he got to know about my interests in meditation and public speaking and asked me to conduct a workshop for 50 EY employees on ‘Work Ethics and Being Happy through meditation’. Their boardroom, where the workshop was conducted, is super awesome! The feeling that one gets while entering it is just out of this world, especially when one stands there to give a presentation in front of such senior people. Truly an enriching experience! I developed a different kind of a bond with all the people in my team. The next week mainly revolved around closure of my project report. I would sit extra hours, read, understand existing proposals and learning about contracts in the media industry, lots of writing and making notes too. I would give regular updates of my progress to my mentor. The work culture at EY is really an evolved one, they focus on quality instead of the quantity of work that one does. Our lunches were awesome, the whole team would sit together and have a jolly time together, food on the same table really helps develop a great bond. The last week was full of reviews of my report, submissions, modifications and appraisal. They gave me a very sweet farewell, with a cake. It was my best experience. I really thank God, my seniors and my fellow mates for everything. Everyday at EY, for me, was productive, successful and full of learning experiences. If Priya’s experience motivates you, you can check the latest internships in Gurgaon and Finance internships.